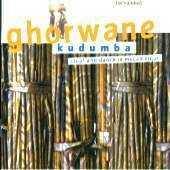 Ghorwane - "Kudumba - Stop! and Dance in Mocambique"
The secret of Ghorwanes music lies in a combination of courageously critical lyrics and a bright and shining sound. Three guitars, one keyboard, a sax, two trumpets, drums and percussion transfer the light and breezy dance styles of their forefathers to the present day with consummate ease. In this Piranha release Ghorwane sing and dance to bolster the will to live and hope in the future Mozambique. Listen to this miracle of converting a tear into a smile!